FugginSuggin.com: UPDATE: #OCCUPYWALLSTREET - Protesting the Financial Sector - Where is Our Bailout? UPDATE: #OCCUPYWALLSTREET - Protesting the Financial Sector - Where is Our Bailout? 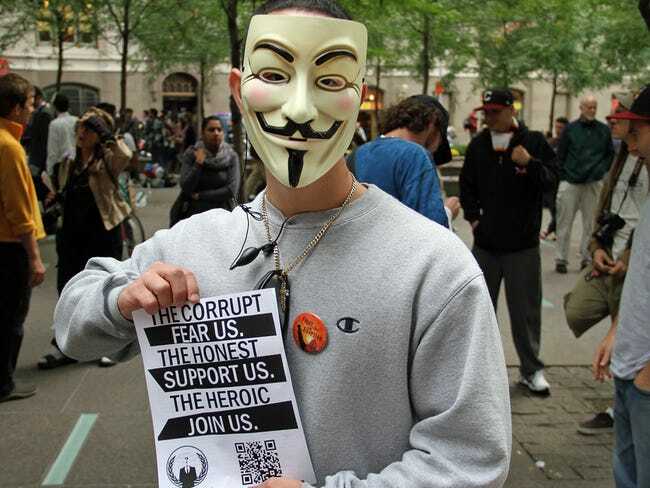 The demonstrators participating in the Occupy Wall Street Campaign are now in their fourth day of protest. Activists have been camped in Zuccotti Park, a privately owned park formerly known as Liberty Park Plaza, since Saturday morning, with demonstrators reportedly numbering at over 5,000 at times over the weekend. Demonstrators have vowed to stay for months if necessary. Based upon the campaign website, there have been numerous arrests (reportedly 7 based on a Bloomberg article), and at least one serious injury. Although the event is now receiving increased mainstream media attention, it is minimal considering the size and vigilance of the demonstration. Reports indicate that at least five people have been arrested or cited for wearing the Guy Fawkes "V" mask in violation of an obscure, 150-year-old NY state statute that bans masked gatherings. According to the Wall Street Journal, New York's mask law dates back to 1845, when lawmakers tried to quell uprisings by tenant farmers who "used disguises to attack law enforcement officers," according to a later U.S. Court of Appeals ruling. The law (N.Y. Penal Law § 240.35(4)) was amended in 1965 to prevent masked gatherings of two or more people, with a significant exception: "a masquerade party or like entertainment." It received substantial attention in 1999 when, on the basis of the law, the city rejected a request from a group of the Ku Klux Klan to hold a masked protest in Manhattan. As further evidence of the efforts the police will go to in order to subdue peaceful demonstrations, another protester was also charged with under anti-graffiti laws for "damage to the sidewalk" for writing a Gandhi quote in chalk on the ground. 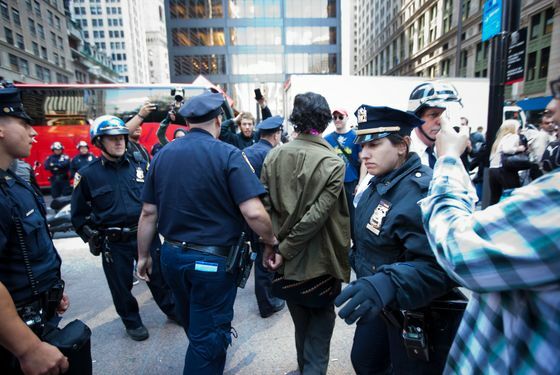 According to the Occupy Wall Street website, another protester was arrested for objecting to the police removing a tarp that was protecting his media equipment from the rain. The police alleged that the tarp constituted a tent. Another demonstrator was arrested for using a bullhorn. The police have maintained a heavy presence in the Financial District since Saturday, partitioning off areas of the sidewalk and slowing pedestrian traffic in a neighborhood that typically attracts heavy tourist traffic. There has also been accusations of online censoring by such sites as Twitter and Yahoo. The Occupy Wall Street campaign has received support from a few celebrities, including Emmy award winning actress and truth activist, Roseanne Barr and rapper and truth activist, Lupe Fiasco (who had a lot of great stuff to say). As Lupe articulates, the reality is that a great many people, including police, union workers, teachers, and all those with IRA's, rely on the stock market for the retirement benefits which they've accrued during their years of work. Therefore, protesting the financial industry is an affront and attack on their prospective retirement account. This makes it very difficult to reach a great deal of Americans, as they are truly complicit, although indirectly, in the corporatocracy that is being protested by those demonstrating for Occupy Wall Street. The financial market should be held accountable for the economic crisis we are in. Unemployment is still high, poverty is at record numbers in the United States, and people are understandably scared for the future. Many people cannot afford to pay themselves out of increasing debt, and when they look at government bail outs like that of 2008, they wonder why they cannot get any sympathy from the government of the financial institutions themselves. This leads many Americans to ask and wonder,"Where is our bail out?" Support this peaceful protest by making your way into New York City or to a local protest in support, and call the news agencies and demand coverage. Educate yourself to the manipulating efforts of our government and mainstream media, to the existence of a police state, to what is being done to our food, to how the financial sector works, and know your rights and then educate your fellow human beings as often as possible. Be the shepherd, not the sheep.